When it comes to cocktails and entertaining, we southern women do not mess around. In fact, we're known for our hospitality, so anything less than sweet, charming, and scrumptious is simply not acceptable. Luckily for all of us, there are places like Lettermade that help make our cocktail parties and afternoon teas that much more special. 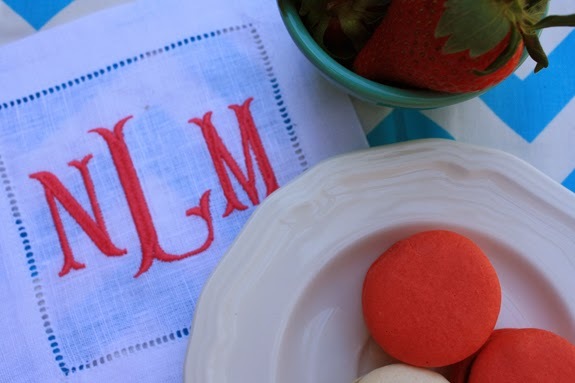 Lettermade is an online retail shop specializing in embroidered linen cocktail napkins, and when I stumbled upon Malia's unique designs, I knew immediately that I wanted to share them with you. Malia is one of those girls who I just know I would be friends with if state lines didn't separate us. Her gumption and kindess is exactly the kind of thing that southern women stand for, and her shop is no different. Today, I have a couple of treats for you! 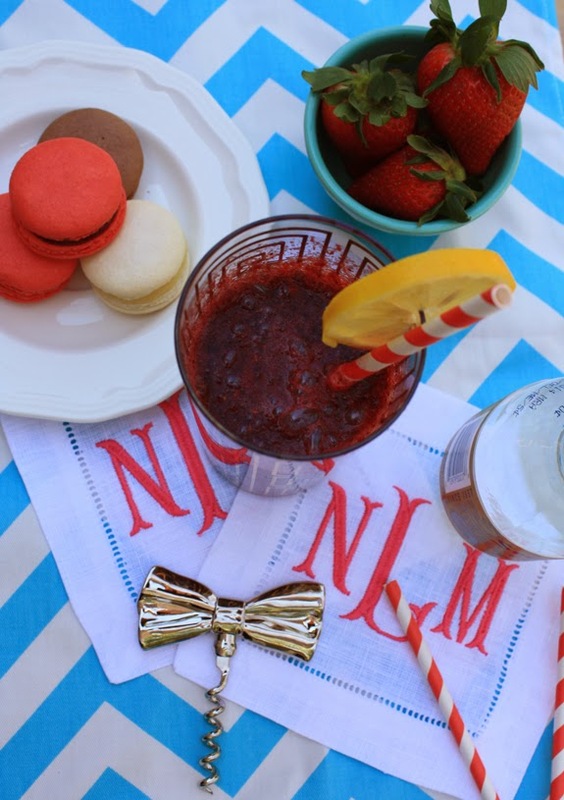 First, a delicious cocktail fit for a fantastic set of monogrammed linens, and then a full interview with the cocktail napkin queen herself! Blend or muddle berries. Add lemon juice to help add a bit of liquid to the mixture. Fill cocktail shaker with ice & add blended berries and gin. Shake well. Strain into a cocktail glass & top it off with club soda & a lemon garnish. 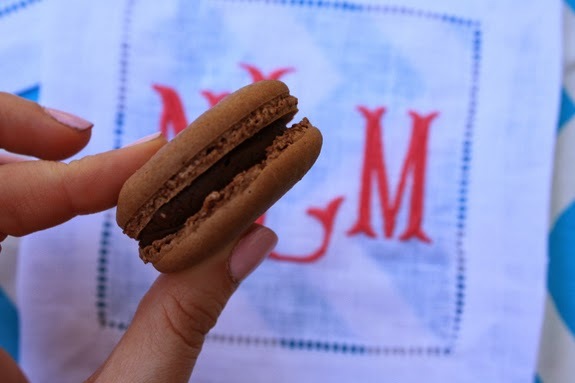 Serve with your favorite Lettermade napkins & a few other sweet treats! Want to hear more about Malia's Lettermade venture? Read the full interview after the jump! I am originally from Virginia, but have spent most of my life in Florida! I spent a brief period of college at the Fashion Institute of Technology in New York and interned for an apparel showroom before attending and graduating from Rollins College here in Winter Park, Florida. Why did you decide to start Lettermade? Embroidery started as just a fun hobby that quickly turned into an absolute love and passion! Lettermade then began from my appreciation for a great monogram and embroidered linens; my grandmother is probably the biggest influence behind Lettermade and its mission. She was the quintessential sweet-natured, Southern lady that made her home welcoming and delightful for anyone who came to visit. She had drawers full of jewelry (fun for any little girl when they visit their grandmother!) and she valued pretty, well-made linens. I hope that everyone who buys Lettermade cocktail napkins feel that hospitable, inviting, "take-care-of" feel when they use their new linens. Dinner parties with friends and family are the best. Conversations over wine, cocktails, or dinner make some of the loveliest memories...Lettermade being part of this is what I hope for! As keepsakes, I have embroidered linens (ladies handkerchiefs, bed linens, etc.) that are so meaningful to me, not only because they were my grandmothers (or great-grandmothers!) but because they are absolutely timeless. Mixing contemporary designs with the traditional craft of embroidery is my design vision for Lettermade. I hope that what I make for others will be part of fabulous get-togethers and keepsakes for the years to come! Tell me what a day in the life on an entrepreneuress looks like. It starts with coffee! Then, I go right into checking emails and making a list of to-do's for the day. I am completely energized by what I do from the start...I love it! Once I plan out orders for the day, I get to my embroidery! There's a lot of jumping back and fourth...I go from embroidery to emails, to working on packaging! Orange is our signature color and we like to make sure that each set of cocktail napkins is packaged with lots of love, a pretty orange bow, and a hand-written note. At night, I finish up whatever still need to be done and browse through my favorite blogs- I am so inspired by fashion and lifestyle bloggers! Dinner napkins later this summer! It will be a small collection of napkins with a fun selection of embroidered monograms. I would be absolutely thrilled to work with so many different designers, magazine editors, and bloggers! I would love to work with a few of my favorite bloggers- I was so excited to be featured on Luella & June right when Lettermade launched in February! Bradley is one of my favorite bloggers, so it was such a treat! Another ultimate collaboration would be with Southern Living; I would be completely beside myself with excitement! Kimberly Schlegel Whitman, Editor-at-large for Southern Living, has put together beautiful tablescapes that are so inspiring! Describe Lettermade in 3 words. Narrowed down to two words it would be "modern traditionalist." The Lettermade gal values classic design and decor stirred up with a contemporary flare! Warm, welcoming, caring, and delightful. Southern hospitality is having a gracious heart without expecting anything in return...and then serving up a cocktail or a glass of iced tea! In your opinion, what finishing touches make a home? The little details! Fresh flowers and the pieces in a home that tell a story! Antique blue and white china that were my great-grandmothers are definitely a favorite! There seem to be so many monogram rules. Can you give us a breakdown of ones that you abide by? There are quite a few monogram rules out there! The cocktail napkins in the shop now are all 3-letter monograms (diamond, fishtail, and script), so that simplifies things a bit! I've worked on marriage monograms (the wife's first name initial - last name initial- the husband's first name initial) or a traditional monogram (first name initial - last name initial - middle name initial). We will definitely add a few great personalized items in the future, so there will be an easy monogram guide on the website to help the customer choose! Finds a reason to celebrate 'the everyday' and dresses up for the occasion!